It’s raining discounts on anything and everything you can buy at Paytm. What started out as an online mobile recharge site has transformed into a mobile retail marketplace. Add to it the Paytm wallet and the company offers a complete package to its users. Paytm was founded by Vijay Shekhar Sharma in 2010 and is owned and operated by One 97 Communications Limited. It offers a mobile commerce platform that enables the users to do mobile recharge, pay bills and shop at the mobile marketplace. The mobile wallet also allows the users to transfer money, avail deals, pay cab fares and book movie tickets. Other services offered by One 97 include mobile marketing, cab and hotel booking, games, music and other mobile content. Paytm is among the few start-ups in India to have achieved a unicorn status, with over $1 billion valuation. As of October, 2015, they claimed to have 50,000 merchants on the platform and processing over 75 million orders a month. 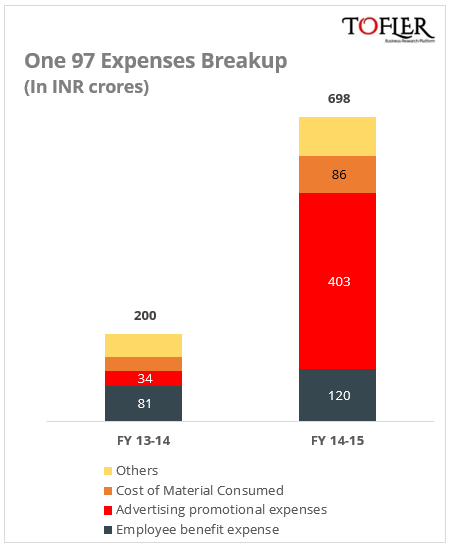 The Advertising and promotional expense, which stood at 57.8% of the total expenses, rose by 1100% over the previous fiscal. The ‘Cost of Material Consumed’ includes Connectivity and content fees, Payment gateway expenses, Logistic, packing and collection cost, Contest expenses, etc. 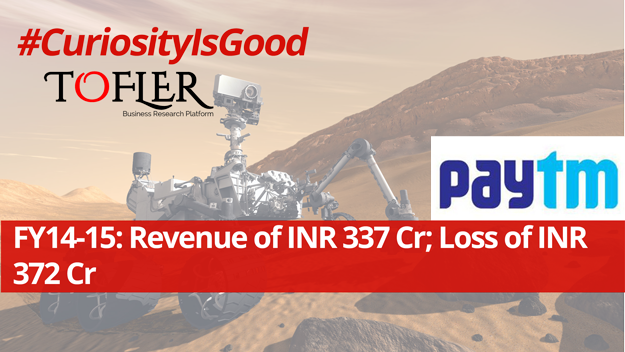 As per the documents available with the Registrar of Companies, Paytm has received total funds of INR 4637 crores so far, more than 96% of which has come within the past one year. Saif Partners had invested INR 62 crores in Paytm in Jan-15 followed by an investment of INR 400 crores by Alipay Singapore E commerce Pvt Ltd in Feb-15. The latter has made an investment of INR 4383 crores in the company so far and is the biggest investor in it. Ratan Tata had also made an investment in Paytm last year. Vijay Shekhar Sharma, an engineer from Delhi College of Engineering, founded One 97 in December, 2000. The company initially started by offering live astrology services for a GSM operator in Delhi in 2001. Over the next few years it launched SMS based applications, VAS for landline, gaming applications and subscription based content services. The real foray into mobile commerce came in 2010 when the company launched Paytm as an online recharge portal. 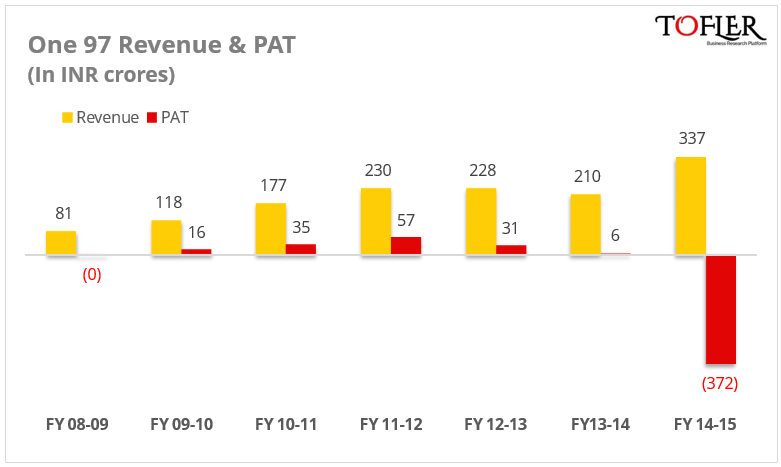 By 2011-12, the company was handling 500 million subscribers on a daily basis. It launched Paytm Marketplace and Semi Closed Wallet in 2013-14. With over 22 million registered customers and 12 million app users, the company was processing 8,00,000 orders per day. Its recent achievements in 2014-15 included tie-ups for Paytm wallet with IRCTC and Uber and reaching million orders per day mark. Vijay Shekhar wants to turn Paytm into an internet conglomerate. On this path, it has acquired consumer behavior AI app, Shifu, on demand hyperlocal home services provider Near.in. It also made key investments in auto booking platform Jugnoo, fitness tracking GOQii, logistics data venture LogiNext, hyperlocal deals startup Little, among others. Paytm got the RBI approval to open Payment Banks and aims to disburse loans to 500 million Indians by 2020. It is also preparing to launch Local and Hyperlocal Deals from the neighborhood stores on the Paytm app. Paytm seems to be revolutionizing the digital and mobile fin-tech space big time with a gamut of new features and products announced in the past year. For Annual Reports, Balance Sheets, Profit & Loss, Company Research Reports, directors and other financial information on ALL Indian Companies, head over to www.tofler.in – Business Research Platform. This article was originally published here by Team Tofler. Author– Vishal, a Sci-fi enthusiast, engineer by mistake and writer by choice, combines his eye for numbers with a natural flair for storytelling to churn out Tofler’s blogs. Editor – Anchal, co-founder at Tofler, is a CA, CS and has more than 5 years experience in company analysis. She likes to explore and track companies, their performance and senior management. Tofler makes no claim of ownership or affiliation with any trademark / logo (REGISTERED OR UNREGISTERED) used in this article. Trademarks or logos, if any, published on this page belong to their respective owners. Who will win the war among online budget hotel players in India? Due Diligence: Does it always have to be detailed? Tofler is one of India's largest private company research platform. Applications include credit assessment, vendor/client on-boarding, competitive bench-marking, sales meeting prep, private equity research, market sizing and others.